Amtrak #6, the California Zephyr, with #100 on point, on a different day from these cab shots -- taken past the detector at MP148. The train is about to pass under Interstate 80. Because these photos take me so long to upload, I need to set aside, literally, hours to create a blogpost such as this -- that is to say, a post that is festooned with more than three or four smaller sized photographs. I finally had that time. For our viewing pleasure today, I present my sojourn into the cab of one of Amtrak's P42DC General Electric Genesis locomotives, #100. This engine is one of a hundred purchased by Amtrak and built in 1997, featuring 4,250 hp and weighing 268,000 pounds (134 tons). This locomotive has a four-stroke diesel prime mover and DC traction motors on B trucks. 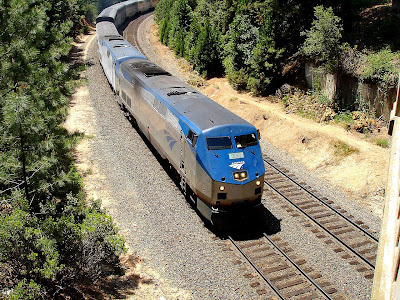 The story is this: Amtrak's #5 California Zephyr is traveling westbound (downhill) over the Roseville Subdivision having already passed Truckee, Donner Lake and Towle. It came to a stop when there were serious track problems ahead. Again, as indicated, I will not be giving details as to time, date, specific situation or even the year involved, in order to keep every cab crew safe and anonymous. This is one primary reason I still am invited into cabs after 16 years of track coverage. That said, because I was taking photographs around the stopped train, the engineer asked if I'd care to climb up into the cab for a tour, anticipating their being in place for at least an hour or two. We spoke at length about our respective jobs, and pointed out a few things about the GE P42DC. First, he said he somewhat enjoyed the ride as compared to freight locomotives, and enjoyed the fact that passenger trains take priority over freight on UP's Roseville Sub. He also said, however, that he didn't much care for the limited view from the cab, or the fact that there wasn't much of a "crash cushion" in the nose; that is to say, freight locomotives have longer noses and collision posts ahead of the cab, enabling in his mind the ability to more readily survive a head-on impact with another locomotive or the end of another train. He also indicated that the Genesis P42 was "top heavy," because the fuel tanks were designed higher into the carbody than freight locomotives, for a more aesthetically pleasing appearance. This translated to, he said, occasional uneasiness for engineers at higher speeds in curves. Continuing, he said, GE four-stroke engines don't load quite as quickly as EMD two-stroke engines, but that is common. Finally, because of the distance from the seat to the window, he misses being able to rest his arm and elbow on the open window sill. We continued speaking about the working conditions, unions and pay scales (Amtrak pay in 2007 was $28/hour; engineer pay in general, as of 2011, ranges between $50,000 to $110,000 per year depending on a large number of factors) of our various jobs and I made a note that I hadn't considered: there are two engineers in the cab. The person sitting in what would normally be the conductor's left seat is called the "co-engineer," because, of course, there are actual conductors on board the trailing cars of the train. Both persons are qualified engineers and spell each other when necessary. Finally, UP's Dispatcher 74 cleared the Zephyr to continue, and the train departed. I had made another friend. Capturing the interior of an Amtrak train is a rarity indeed, because seldom do Amtrak trains stop -- and only briefly -- at their appointed stations. The right (engineer's) side of Amtrak #100. As opposed to freight locomotives, this series of GE engines feature suspended seats with cloth instead of heavy-duty vinyl coverings. You can see that, if spun forward, the seat would be a number of inches away from the engineer's window. Resting your elbow on the window sill? Not happening. The co-engineer's seat, left side of the locomotive. Many of the screens and controls are duplicated on this side, as opposed to a freight locomotive -- which provides little (if any) input or monitoring for the freight conductor. Just behind the co-engineer's seat (lower left) is the cab refrigerator. Looking out the left side door, forward. Rearview mirror provided for the co-engineer. As opposed to a freight locomotive, there are bi-lateral doors on a GE Genesis engine because there is no nose door. HEP (head end power) control panel on the co-engineer's side, along with the large red emergency brake button on left, and red HEP cutoff button on right. Overhead view of engineer's seat, with yours truly in the right-side rearview. Right side engineer position has two CRT screens, in order to switch from various necessary command views and monitor two screens simultaneously. GE display, indicating that HEP is on, HEP is running at 427 amps, train is stopped, 93 pounds in the brake pipe. Sitting in the co-engineer's seat, looking toward engineer. Seat facing forward, left armrest up. Chatting with the engineer, whose right elbow I actually expose here. Nice bag of chips. Cab crews get hungry like anyone else. And, unless stopped, cab crews can't be reached or fed by passenger cars due to the configuration of the locomotives. They are isolated. Co-engineer's side, sun shade pulled down, CRT screen in middle. Here, you can see all three seats available in a GE Genesis locomotive. On right, engineer's seat. Upper left, co-engineer's seat. Engineer leans on middle seat, for one extra cab occupant. You can see that not only is the floor rubberized for noise isolation, but there are floor equipment access panels as well. Middle bin contains reading material and digital programmable radio. Left graphic display on engineer's side. Close-up of engineer's desktop control panel. From left to right: Reverser (handle removed and with engineer per rules), throttle & dynamic brake then, on the right cluster, the automatic brake (for train) and independent brake (for the locomotive). Forward to apply braking, back to release. Alerter switch reset at the lower right. All three seats captured vertically. Co-engineer left, engineer right. Desktop controls, both screens, light and control detail panel on right. Middle of cab-wide desktop panel, engineer position and controls on right. Close-up of HEP control panel. Cup holders across the desktop. Vertical shot of engineer's position, taken from engineer's seat itself. Here is what the engineer actually sees down the road, dead ahead. Close-up of co-engineer's desktop portion. Phone handle is for locomotive radio. Overall vertical view of co-engineer's (left) side, to include middle seat. Shot from engineer's seat. Close-up view of engineer's desktop position. Click to expand for control detail. See sanding and bell controls on left side vertical strip. Buttons are blue in color. Back (aft) bulkhead control panel. This is to the right of the engine room access door, right side of cab. Trash bag below. Isolation panel just above bag. Numerous circuit breakers and panels above. View of engineer's desktop controls and panel, taken from center seat. Same, with clipboard and engineer's paper towel "reminder," given to him from Dispatcher 74. Overall view of co-engineer position, from engineer's seat. Looking directly out the front of GE Genesis P42DC Amtrak locomotive #100, from the engineer's seat. This is what the engineer sees, fifteen feet above the track ahead. Please enjoy, read the captions, and click on each photograph to enlarge for detail.